Larson Electronics has announced the release of an explosion-proof, 100-watt LED light for use in flammable and outdoor locations. 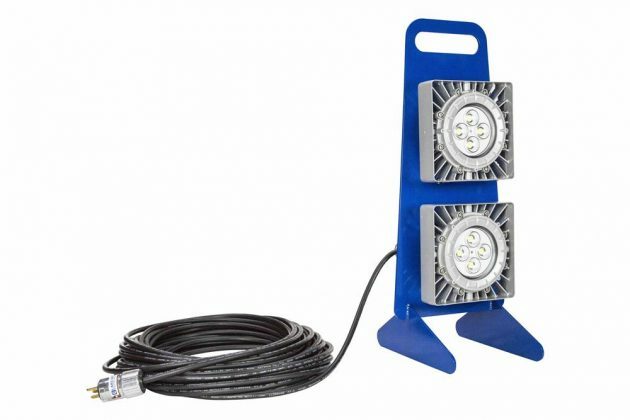 This fixture is equipped with two 50-watt LED lights producing 11,600 lumens of light. This light is made of non-sparking aluminum and features 100 feet of 16/3 SOOW cord with an explosion-proof straight blade plug. The EPL-BS-2X70LED-100 portable, explosion-proof LED light offers 9,000 square feet of work area illumination, giving off 11,600 lumens of light with a color temperature of 5,600K and colour rendering of 75. This light fixture comes available with either a 360˚or 180˚ beam spread and features two LEDs mounted to a handheld aluminum frame with an explosion-proof on/off switch on the back of the frame. This unit is rated for use in Class I, Divisions 1 and 2, Groups C and D; and Class II, Divisions 1 and 2, Groups E, F and G hazardous locations. Larson Electronics’ explosion-proof LED light fixture resists dust and dirt and is protected against high-pressure jets and temporary submersion. This light is universal voltage capable and can be operated with 100-277V AC 50/60Hz, with a low-voltage option available. This fixture is suitable for use in commercial and industrial settings where flammable materials may be present.